Can I make my 3d books file a little smaller? Q: Can I make my 3D books file a little smaller? Yes, absolutely you can. The size of 3D book file is determined by you. Necessarily you should learn why the file is big and what you should do when you convert a PDF file to a 3D flipping book. As we know, the bigger the file is, the higher quality the 3D page flip book will be. So when you want to reduce the 3D book file, you need to make deep consideration. Does the result affect your business? If the answer is YES, I will suggest you to take a ZIP file for your flip book. Now, I am sure that you are clear about this. Follow the next steps to change the size of your page turning book file. 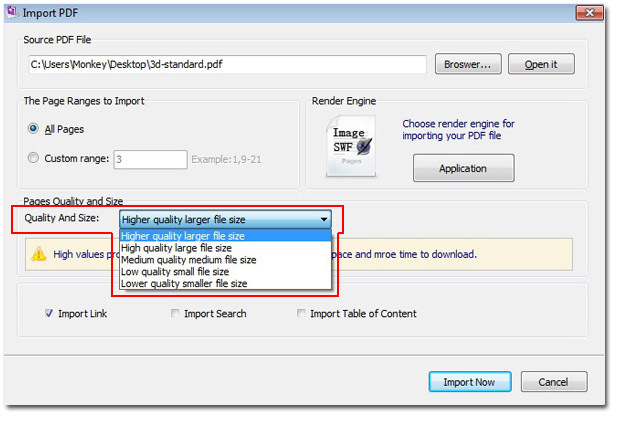 Step1: Before you import your file, you can find the tab "quality and size" and select the one you need. 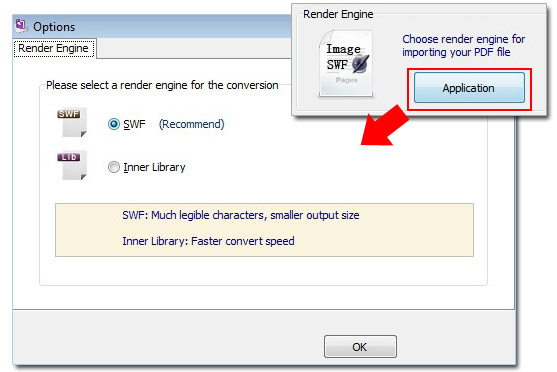 Step 2: You can choose the render engine to import your file. As the picture shows below, different render engine is of diferent file quality and different file size. The first one is the suggested one because it has the great quality with suitable file size.